As May is Mental Health Awareness Month, I thought it was a good opportunity to share some ways in which I've been looking after my own mental health. Ironically or not, it was a year ago, in May 2015, when I realised a person's mental health is more fragile than I'd ever imagined. I'd always considered myself to be a fairly strong, extrovert person so it caught me off-guard when I discovered that I'm not invincible. Thankfully, a strong team of family, friends and colleagues encouraged me to visit my doctor and get some help. Since then, I've personally vowed to put my mental health above almost everything else but particularly above work. All of the following tips have contributed to me having a much better year. Work email removed from phone - This was one of the first things I did. I'd often check my emails just before bed and then struggle to sleep because of what I'd read. I now have to physically choose to look at my work emails at a time which suits me rather than have them interrupt my life. Notifications Off - This was the second thing I did. I didn't realise quite how much my phone notifications were breaking up my day. With those interruptions gone, I focus much better on friends, family and work. Time limits for work - I made it 8pm for me. I don't always stick to it but I try to stop at 8pm every evening. It was important to let my team know that, if they need me urgently after that time, they should text me. Saying "no" - I'd always been a yes person, trying to please everyone I encounter. Unfortunately, that just wasn't healthy and made me incredibly busy. It's perfectly OK to say "no" and I'm learning to be OK with that! Saying "yes" to exercise - I originally thought the best way to help myself would be to stop doing things so I cancelled all my netball and stoolball matches and stopped running. With hindsight, this was the wrong thing to do. Exercise is so important and I felt my best when I started playing in a team again. Removing the guilt - It's so easy, as a teacher, to feel guilty about cutting corners and working less. I like to think that I'm working smarter rather than less hard but the truth is I have literally had to cut things that I used to do for work. This is probably the hardest thing to do...I'm still trying! Enjoying housework - Never before have I understood how people can enjoy housework. I found it very theraputic and would often do some ironing in front of the TV to keep my mind busy. Long, quiet, relaxing baths - I've always hated baths. By accident, I ended up needing one to help some paint soak so it could be removed from my hands. Eureka! Baths are actually really enjoyable. Add in some lavender baths salts, oil or my favourite bath bomb (who knew they could be so fun?! ), a few lavender candles and a Kindle; a perfect recipe for relaxation. Reading - I've never really been one to read non-fiction but I found myself being inspired once again by Katie Piper's story and message of hope. Over the summer holidays, I read her book, Things Get Better, which uses her acid-attack experience as a backbone to show that we can all survive life's setbacks. I also found the daily motivational quotes and commentary in Demi Lovato's book, Staying Strong, useful. Getting a massage - I agree with Sylvia Plath (now) about baths but I'd suggest a hot-stone massage can do the trick too. My in-laws bought me a voucher for one as a present and I've returned again and again at appropriate times during the school year. They are so relaxing that I have to have a long rest afterwards at home!! I feel this post must come with an important disclaimer. Firstly, just because any one of these tips worked for me doesn't mean it will improve your own mental health or work-life balance. Secondly, if you are really struggling with your emotions and wellbeing, your first port-of-call should be your GP who can recommend treatment in an appropriate form. Finally, as I often say on this blog, those of you who are full-time class teachers with children at home are absolute heroes to me. I have no idea how you do it and have endless admiration for you. So many of the things that have helped me would be nigh-impossible with some mini-mes running around! Parents - I salute you. At the end of July, I will have completed a mere five years in teaching. It sounds like a short amount of time but I can't say it has passed exceptionally quickly. 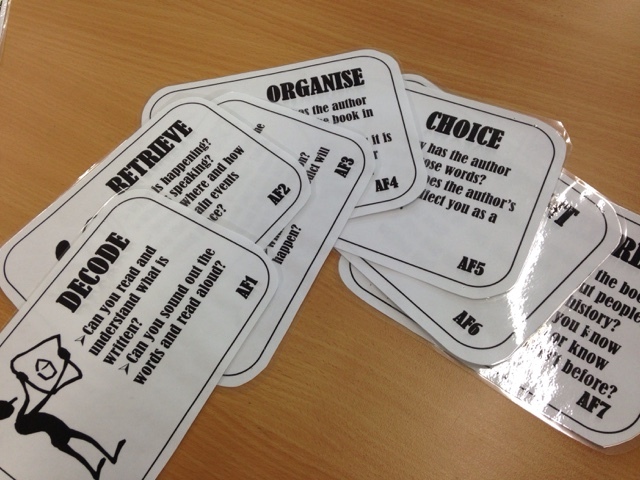 Recently, I came to sort out my cupboard in a bid to locate a "Little Miss Bossy" book which we use to teach imperative verbs. In sorting through some of the items in my "teaching resources" and "displays" boxes, I started to do something which teachers rarely do - throw things away. All of these items I had kept "just in case". However things have changed in my classroom in the last five years so much that these are no longer worth keeping. 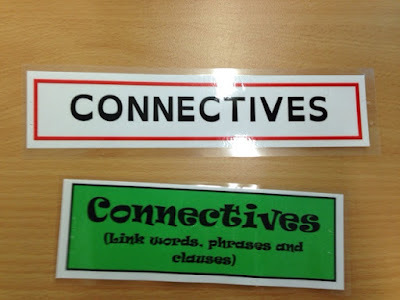 Some of the changes are down to my classroom practice and beliefs about education. Other changes have been imposed from the government down. I am sure you can work out which are which! So here I present my Education Graveyard of the last five years. I have written previously about how I was an ability group obsessive. Over the last five years, I have gone from having ability groups for all core subjects to having no ability groups whatsoever. Everything is taught whole-class in mixed-ability groups. 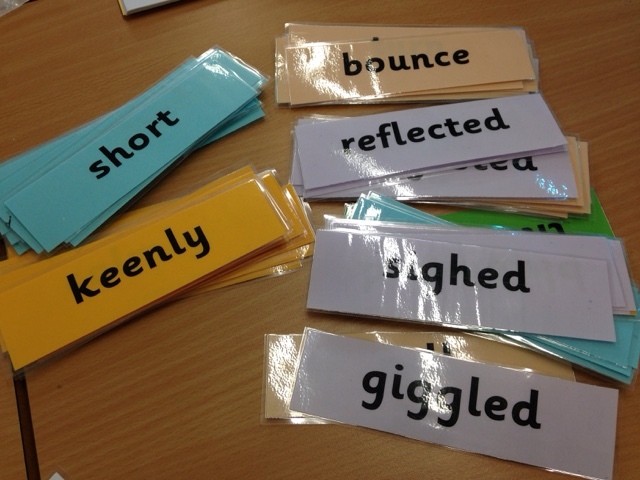 Movement is fluid so children can have adult support when needed and complete paired and group work successfully. Read more about what I do instead here. 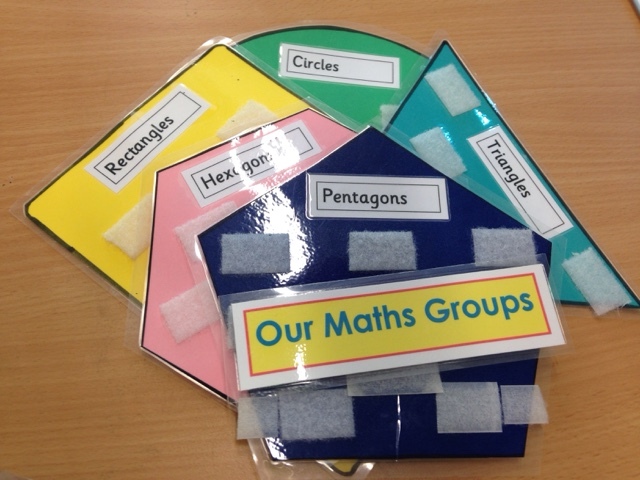 These velcro grouping charts were satisfying to throw away as I remember hours spent trimming, laminating, trimming again and velcro-backing the names that went on each set. Also, notice below the death of "Literacy" and the rebirth of "English". The death of the humble connective. OK. Perhaps not so much a death but a retirement from duty. Instead we welcome to the scene: conjunctions. What's the difference? Who knows?! Why the change? Who knows!? I wonder, if we had a change of government, whether they'd rename them again. It was too much of a long shot to keep these. Bin. 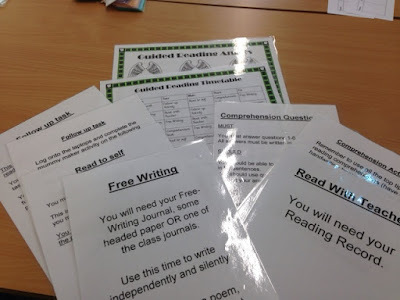 If you've read this blog for a while, you'll know that I stopped teaching Guided Reading in favour of whole-class lessons nearly three years ago. Despite this, I apparently still kept my master timetable, monitor cards and information sheets. We have gone on a long journey with whole-class reading and I have documented every step in this blog post. Needless to say, these didn't require much thought before they made it to the dustbin. APP was far from perfect. However, what it did provide for us, in all core subjects, was an overarching focus for sets of our objectives. These seemed fairly logical to me and were easy to differentiate. 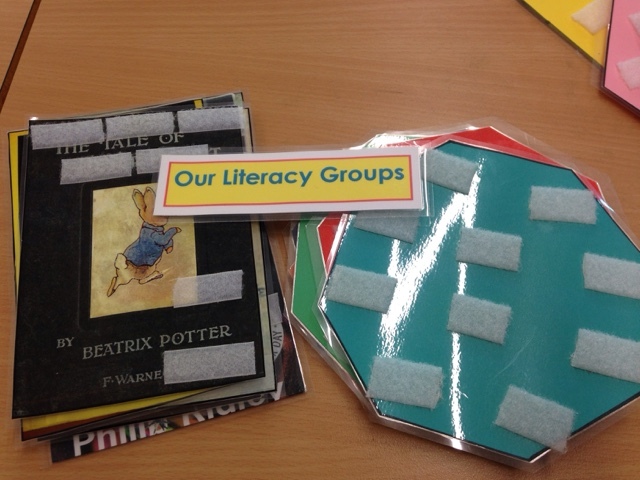 Unfortunately, the new curriculum provided nothing of the sort so we had to cobble up our own. I feel like pre-made word walls have had their day. Now this may be because I work in a school with a strict nothing-stuck-on-walls policy. Or it may be because I prefer for displayed words to be more flexible and come from the children's ideas. I still enjoy using Scribble HQ - my writing working wall and so no longer have a use for these resources. As it turns out, I never found the "Little Miss Bossy" book so I'll have to keep searching for that!